I had an incredible time exploring Holcomb Creek Falls near Clayton, Georgia over the weekend. It was a beautiful hike and the fall was stunning. I captured this image using my 16-35mm f/4, tripod mounted and using a circular polarizer. For this capture, I had to balance the tripod on the rails of the footbridge at the base of the falls. The bridge was too narrow to set up my tripod properly. I hope everyone else found the opportunity to get out and explore also. Thanks for stopping by. Stunning! I need to put Holcomb Creek Falls on my explore Georgia list! Thanks and good call, Elisa. It’s a great location. That is a truly fabulous photo. Awesome! Beautiful photo the creek. That looks like an inviting place on a hot day! I’m a bit envious. I couldn’t imagine how much patience it would take to paint a scene like this. That paired with my inability to ever be completely pleased with any of my captures in camera. I would probably sit down with an easel and paints and sit there until I died of hunger and thirst simply trying to accomplish perfection. You are much more patient than I could ever be. Thanks for the kind words, Joanne. What a beautiful area. You all have a lot more water than we do. Nicely taken and shown Toby! We are fortunate to have an abundance of water. 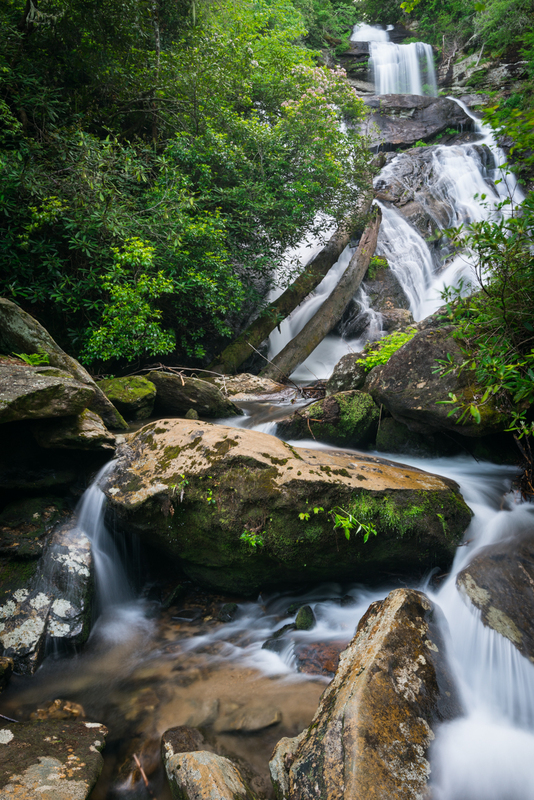 Pairing it with the mountains and scenery in the Blue Ridge and the Smokies makes it a very special place. Thanks for the kind words, Deb. Thanks for visiting my blog. Your photographs are really beautiful and capture colours as nature intended them to be seen. I am inspired to work harder with the camera! Thanks for reading what I write Toby, your photographs are lovely – I just point and shoot to get overall pictures and do not compose anything – so am awed by people who make it an art. Toby, all your work is spectacular, but this one is just gorgeous…something about the path of the water splitting and recombining. I’ve been photographing local waterfalls falls in MD and VA, but have a lot to learn photography-wise. Thanks for the inspiration. Happy holidays to you and yours. Thanks for the kind words, Chris. I’m sure there are plenty of waterfalls in your corner of the world. Your blog is amazing. I’ll be spending some time there for inspiration for sure. I hope you and yours were able to spend some quality time during the holidays and I wish you all a happy new year. Such lovely photography. I’m so pleased to view your work Toby. Thanks for the kind words, Emily. I’m happy you found my blog because now I found yours. It’s wonderful. I’ll be following. Happy new year.